17 March 2007 (The Brunei Times) – Liz Price’s feature in the Brunei Times about the archaeolgical finds in Lenggong, Perak, including the Perak Man, Kota Tampan site, Gua Gunung Runtuh and Gua Harimau. PERAK Man, Peninsular Malaysia’s oldest inhabitant, is well travelled despite his great age of 11,000 years. A few years ago he went to Japan for an exhibition, and in 2001 and again in 2006 he visited Kuala Lumpur where he starred in his own exhibition called Perak Man. Now he is having a well deserved rest and is back in his native Perak, where he is residing in the new Lenggong Museum. He is, after all, one of the most important inhabitants to have lived in Malaysia, because his bones survived to tell the tale. Perak Man, found in 1991, is the only complete human skeleton found in Malaysia. The cave which was his final resting place is called Gua Gunung Runtuh and is situated in Bukit Kepala Gajah in the Lenggong Valley in Ulu Perak. The skeleton, found by Prof Zuraini Majid and her team from Universiti Sains Malaysia, has been dated about 11,000 years, which makes him a Stone Age man, from the Palaeolithic period. 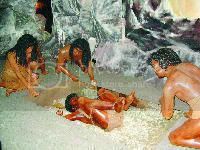 It is believed Perak Man was an important member of his tribe judging by the way he was buried, in a foetal position, and accompanied by stone tools. He was about 157cm tall and probably aged between 40-50 when he died. He had an atrophied left hand and one finger was deformed. The skeleton, remnants of tools and food such as shells and animal bones were found in the cave as well. The first time I went up to the Lenggong area, I visited Gua Gunung Runtuh. Although there was nothing to see except for the pits dug in the floor by the archaeological researchers, it was easy to get the imagination going, and to reflect on how Perak Man and his fellow humans had used that cave as a shelter. The Lenggong valley is one of Peninsular Malaysia’s most important areas for archaeology, as excavations have revealed many traces of Malaysia’s prehistory. The town of Lenggong is situated some 100km north of Ipoh on the Kuala Kangsar to Grik road.